The twelve pointed seal is created by two six pointed seals overlaid. The centre point is just to the south of the church, this area was dowsed and showed a high reading using the pendulum method, Tetford is a very pleasant place and celebrates Beltane/ May Day or Scarecrow / Green Man day each year on May 1st. Tennyson was also born at Somersby..which is situated in a smaller triangle within the geometry.The N/E seal point has an old footpath going to the Green Man plantation and is depicted on the graphic. Remember Temple Bruers left pentacle arm points to Green man wood, at the end of Green man lane…near the site of the Green man Inn. Lots going on here with the placement of villages, churches and high points most of which relate to the geometry. Seal points.- Belchford church, Fulletby church/high point - blue circle, Farforth church, Harrington church, Walmsgate medieval village, Oxcombe high point - blue circle, Ruckland high point - blue circle, South Ormsby crossroads, Brinkhill lake/reservoir near site of ancient moat. Two other seal points, to the south,…point near to Stockwith water mill…mentioned in Tennyson’s work,.and to another high point near Hagworthingham Grange. The remaining seal point goes towards Greetham village although this lies just outside the circle …see graphic. Interesting again to note the roads and how they follow the geometry, crossing at crucial points and running along and parallel to the lines as do some of the old pathways marked in green. The main axis line entering near Harrington, through Tetford centre and onto Oxcombe high point also leads onto the Maltby complex hitting the Maltby west circles centre. Tetford is also perfectly aligned with the Hagworthingham south circle and the South circle of the Maltby complex, which then creates a perfect 90 degree line to the Temple Bruer seal centre marked by Temple Bruer church. 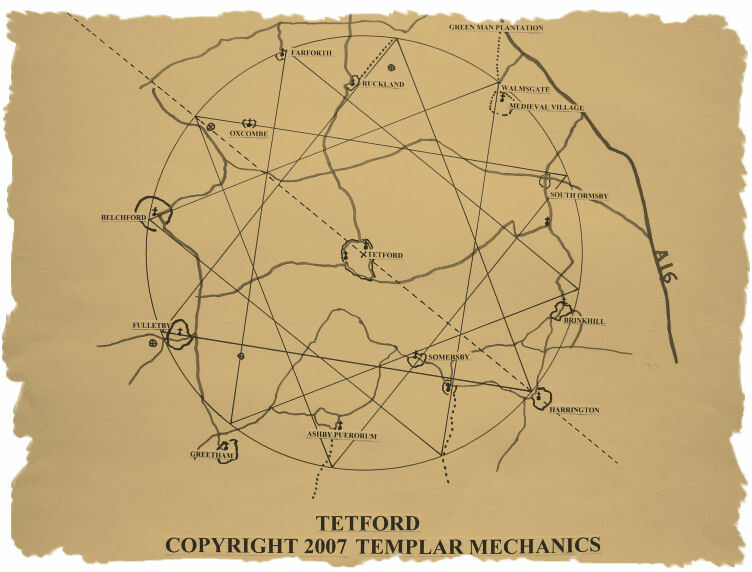 The geometry is based on a circle diameter of 5.15 miles….10,000 megalithic yards and drawn on to the OS 1:25000 and 1:50000 scale maps.